In 1866, Pope Pius IX entrusted the image of Our Mother of Perpetual Help to the Redemptorists with the charge "to make her known." Today, 145 years later, she is known the world over. 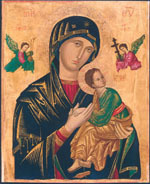 The Redemptorists celebrate the Feast of Our Mother of Perpetual Help on June 27. In many places, like Limerick, Ireland, the faithful flock to Redemptorist churches for nine days of prayer to ask the intercession of this gentle, compassionate Lady. For those who can’t make it to a novena service, we invite you to join us here at redemptorists.net. Prayers will be available in English, Spanish, French, Tagalog, and Vietnamese. The novena begins on Saturday, June 18. We invite you to share any intentions you’d like specially remembered during this novena on our Prayer Requests page. The Redemptorists and those who join us these nine days will remember you and your intentions. On the move? Download our Novena iPhone app, and take the novena with you!